Ok, enough business…I have a finished object! Mods: I shortened the sweater body and sleeves, modifying the deceases appropriately so it would actually fit me. I also got gauge with a 6 US and then went down 1 needle size so the sweater wouldn’t be so sloppy. Pre-blocking, it fits! With the summer upon us, it seemed a most appropriate time to finish up a heavy wool sweater so that I could put it away until the fall! Actually, I just really wanted to finish it and get it out of my hair. 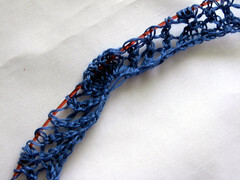 I now plan to fully devote myself to lace, lace, lace – yes, of course I’m participating in Seasons of Lace! 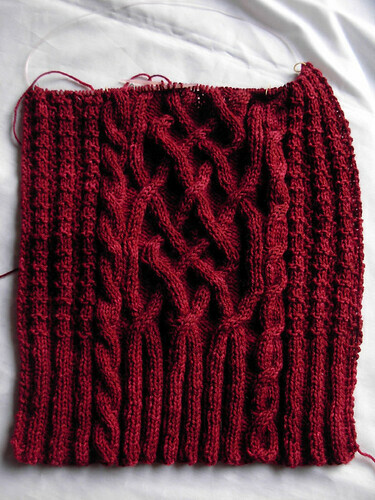 I have a 2 projects already on the needles and several more planned – probably more than I can finish, but it’ll be fun trying. 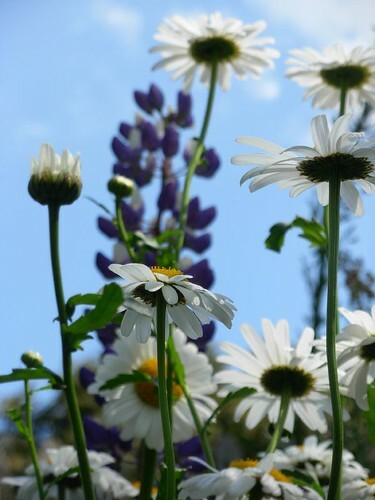 And I have these to look at…. However, overtime does not (yet) mean no knitting. I’ve successfully managed to finish (1) back for my Dickinson Pullover. 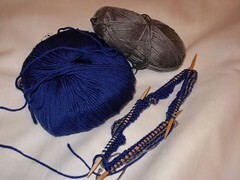 This is the start of Anne‘s Pear and Trellis scarf. As soon as I saw the pattern, I knew I had the perfect yarn already in my stash. This is the ColourMart Cashmere/Silk 3/45NM Laceweight I bought last November. It’s lighter than the pattern calls for, so I’m using two strands together, which seems to be working. I’m thinking my cast on was too tight though, so I’m going to restart tonight. I also managed to pick up another lace book, which of course means more projects for the queue, one which I particularly like. I’ve been eying A Gathering of Lace for several months, and finally bought it this week. 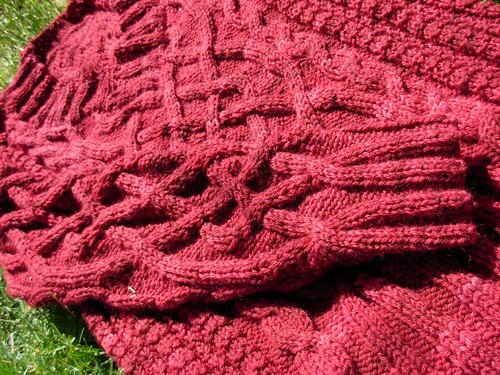 The Vine Lace Cardigan (Ravelry link) caught my eye, so if I can find an appropriate yarn, I think it will be my next sweater project. Which should be sometime around October when we’re finally past overtime season (at least for a day or two) at work! are no more. Almost exactly a week ago, I had LASIK. I knew to expect that my eyes wouldn’t be perfect right away, that maybe they might be itchy or dry. They forgot to tell me that after I woke up from the recommended post-surgery nap I’d be bored out of my mind! I don’t know if it’s the same for everyone, but it took a while for my eyes to get back to “normal”. 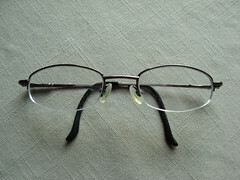 (OK, they’re not normal for me – I can actually SEE! No, I’m still not used to it, yes, it’s a bit freaky.) Middle distances were great, but it was a day or so before I could see up close and really far without everything being “weird” (which is the best way I have to describe it – I could see to read, but it was just “weird”). Which meant that knitting wasn’t exactly something that was on the to-do list. However, I was bored. Very bored. 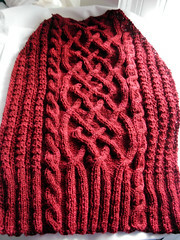 I did finish another knit the next day, which I might get to use this spring. If I can get it blocked; alas the blocking surfaces are all unavailable for the foreseeable future. i’ve had a bit of startitis lately. 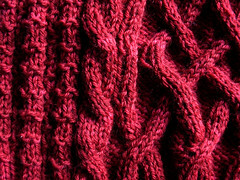 i couldn’t restrain myself, and finally swatched for the dickinson pullover from the fall 2007 interweave knits. in an unheard of (for me) turn of events, i got gauge on the first try. row gauge, stitch gauge, perfect. that never happens. however, it also only further reinforced my notion of myself as a loose knitter. 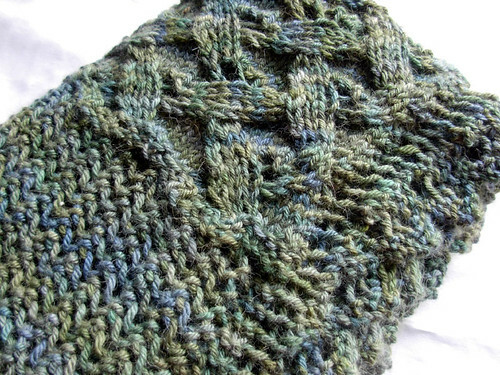 the pattern calls for a “bulky” yarn (7wpi) and us 9/5.5 mm needles. 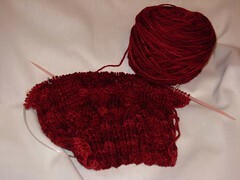 i’m using an aran weight (10 wpi) and got gauge with us 6/4.0 mm needles. by my reckoning, the math shouldn’t work out – with a lighter weight yarn, i should actually be using closer to the size the pattern calls far, if not larger. instead, i’m…well, i’m a very loose knitter. i’ve actually gone down a size, as i don’t like the finished size options for the sweater – 33-1/2″ is too small and 40″ seems too large. 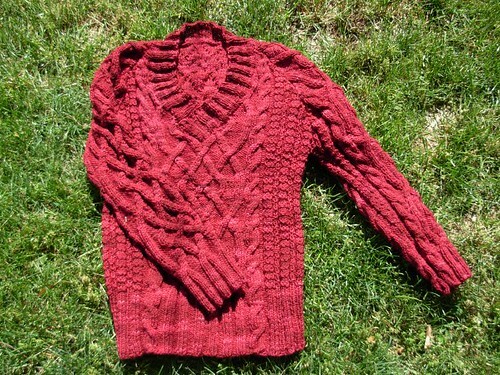 by going down a needle size and knitting the 40″ i hope to make a slightly smaller sweater. so far, i’m about 6-1/2″ into the first sleeve. i am a little worried about having enough yarn. i don’t quite have enough for the 40″, according to the pattern. however, i’m planning to shorten the sleeves by about 2″, and maybe the body as well. keeping my fingers crossed. my dad requested a winter hat, so i’m obliging. he’s worried about wool itching (even though the cascase 220 superwash i’m using is unbelievably soft) so i’m making an outer layer (the blue, #813) and an inner liner of a cotton/tencel blend (the gray, #0499). hopefully this will be a quick project, because…well i need to finish something! further complicating matters – anne just released her latest shawl pattern – and as soon as my yarn arrives, i’m casting on!